We boarded a van to the Juneau Airport, which was about 15 minutes away. At the tour headquarters we were first asked to sign our life away, and then were given a safety briefing. They equipped us with heavy boots, gloves, waterproof pants, waterproof jacket, and a harness. We walked out onto the helipad and boarded our helicopter. 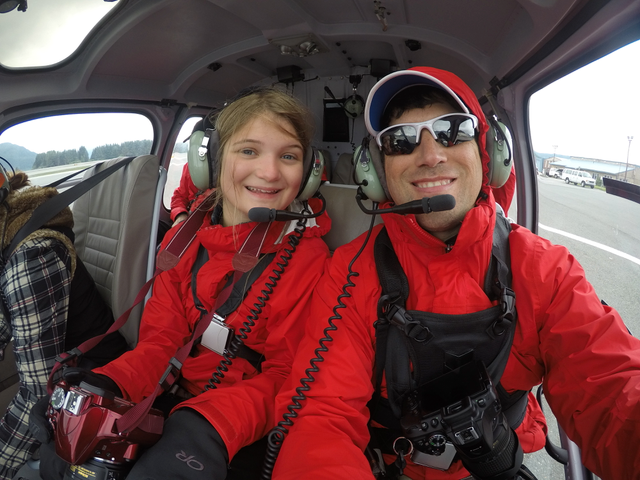 Kate and I got to sit upfront with the pilot Jenny, who is a resident of Juneau. She actually said that she frequently goes on hikes in Juneau and will pan for gold in the rivers. She said there are only two rivers where she has not been able to find gold. 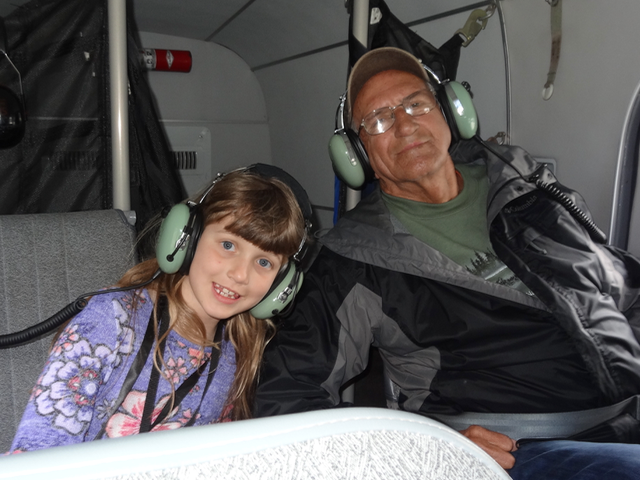 This was our first time to ride in a helicopter, and it was an incredible experience. The views were breathtaking and it felt like we were floating on the air. 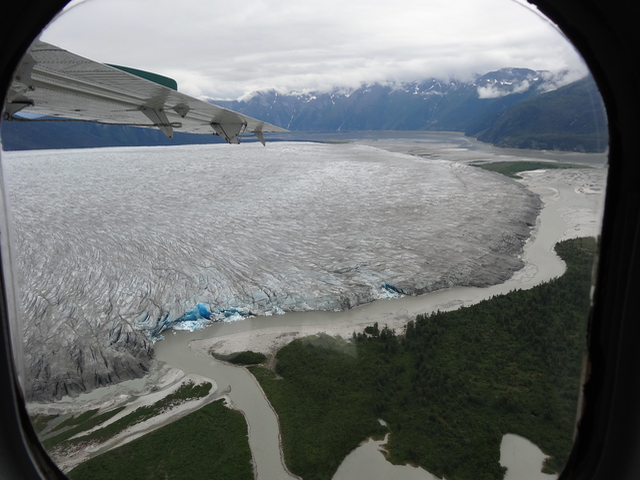 During the flight we got to see the Herbert Glacier and flew extensively over the Mendenhall Glacier. 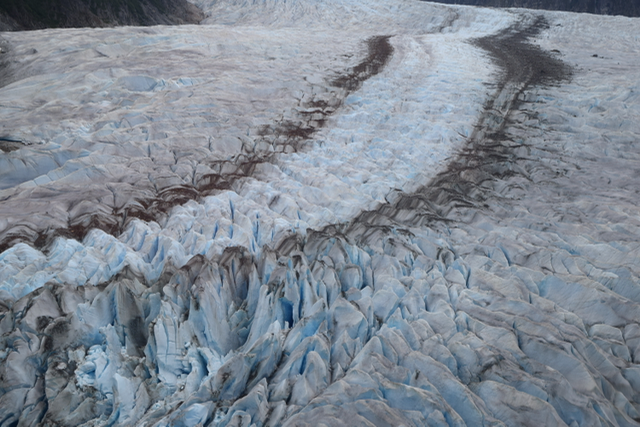 The colors in the glaciers were indescribable, and the size is just overwhelming from the air. 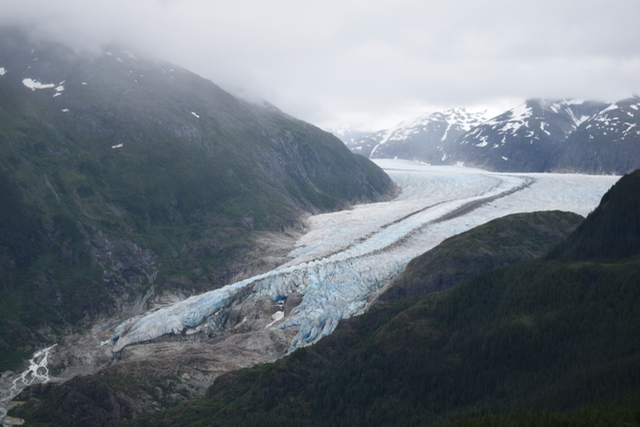 The Mendenhall Glacier is fed by the Juneau Ice Field and is 40-miles wide at its thickest point. 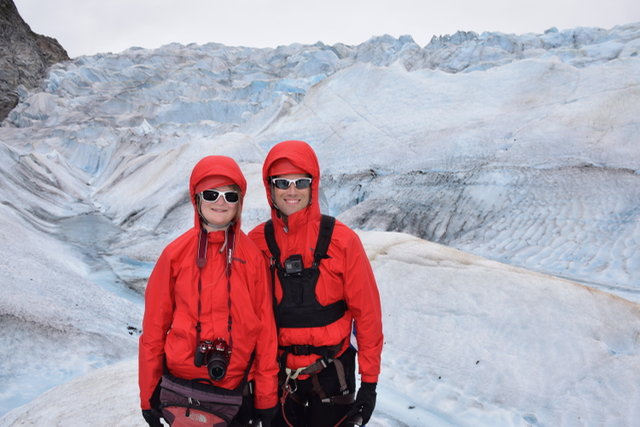 We landed just up from the mouth of the glacier and walked gently over to the base camp. The temps on the glacier were in the low 40s with a steady breeze. At the base camp we met our guides James and Bo and were further equipped with a helmet, ice axe, and crampons. Then we spent the next two hours hiking on the glacier, and it was easily a top-10 event in my life. This was especially true, because I got to share it with Kate. The first hour was mostly in the flat area, and the second hour was up in the hills. 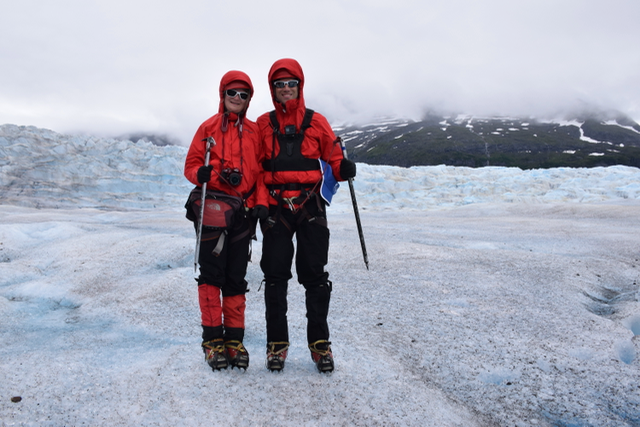 Walking in the crampons was a little awkward at first, but they provided great traction on the glacier. During the hike we saw water-filled holes in the ice that were up to 100 feet deep. We saw waterfalls, crevices, and streams. They told us that some of the crevices had been there for years and some that were 15 to 20 feet deep today were only a foot deep two months ago. Near the end of the hike we filled our water bottles from a glacial stream and got to try some. As Kate said, it tasted just like any other bottled water, but it was very cold. 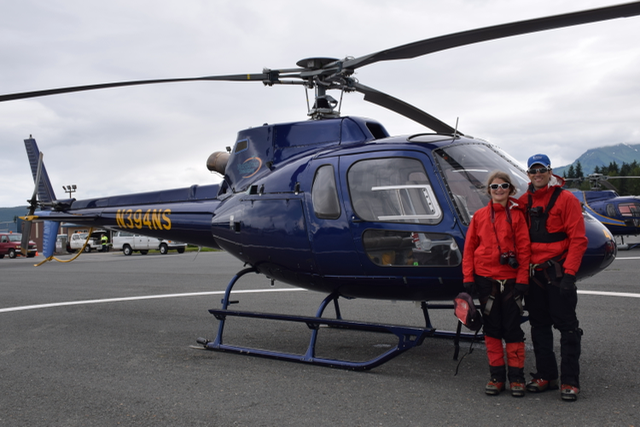 After the hike, we boarded the helicopter for our return trip to the airport. 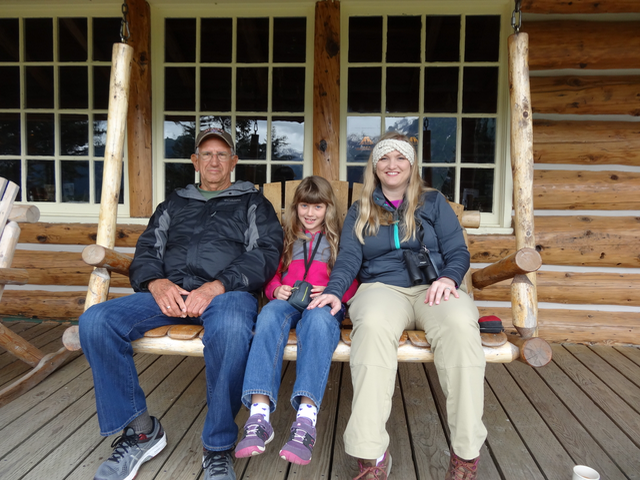 While Kate and I we were hiking, Papa, Olivia, and Sara took a float plane to Taku Lodge. On the plane ride each way they were able to see five different glaciers, and some of their pictures were spectacular. Olivia said that the beauty was overwhelming. 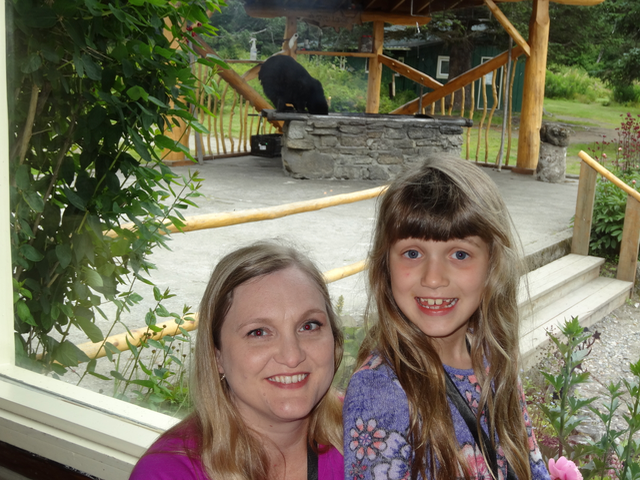 At the lodge they got to enjoy some grilled Salmon that was prepared outside and then watch some black bears come in and lick out the grill. After our tours were over, Kate and I met Olivia and Sara at the pier. We walked to downtown Juneau, where Kate and I enjoyed a reindeer sausage hot dog while Olivia and Sara had some ice cream. Juneau is the Capital of Alaska with a population of 32,000. 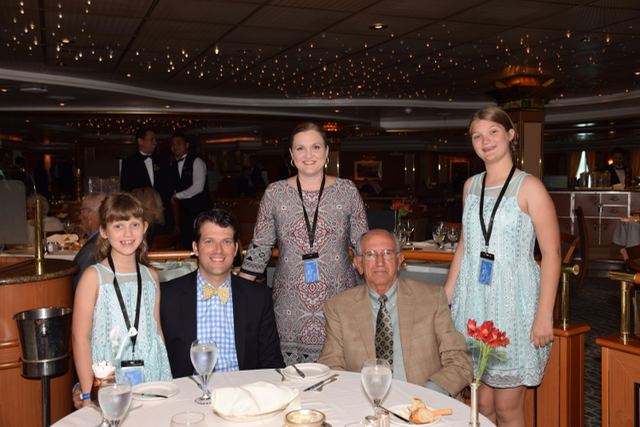 Back on the ship it was formal night and they had escargot and lobster for dinner. When our waiter Ador explained escargot to the girls, Sara had the most disgusted look on her face. All of it was delicious and Papa and I had seconds of the lobster. 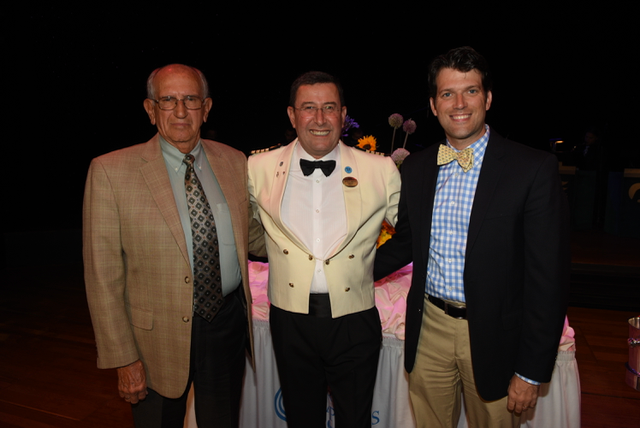 After dinner Papa and I attended the Captain’s Circle Reception because I’m a Gold member and he is Platinum. We got to meet the Captain, who has been on the Coral Princess since 2004, and with Princess for 29 years. 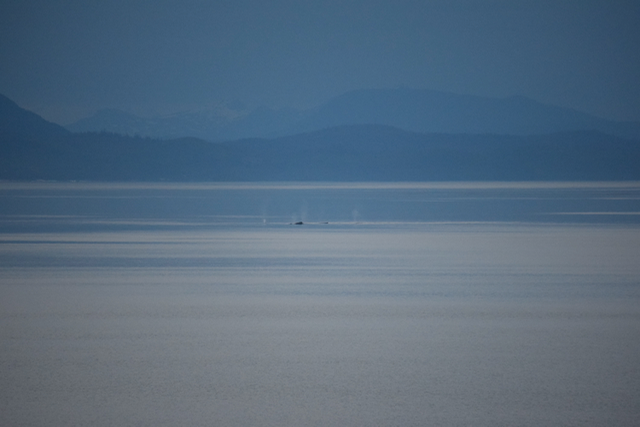 Just before turning in for the night, Olivia, Kate, and I saw a pod of humpback whales off the port side of the ship. We saw at least five spouting at the same time. It was awesome. Tomorrow is our last port in Ketchikan.